Co-ordinate your colours and enjoy your music or movies in style! 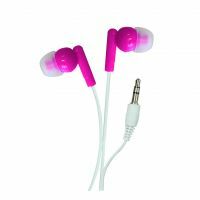 The lightweight in-ear stereo earphones for everyday use are compatible with most portable audio devices including MP3 Players, iPhones, iPads and other smartphones or tablets. 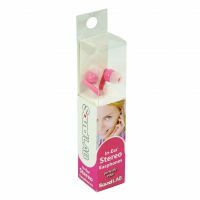 The ear buds are made from super soft silicone for a perfect fit. With a 3.5mm stereo jack and anti-tangle 1.2m lead. Our shipping policy is simple, at this time we only deliver Monacor products to addresses on the UK Mainland between Monday and Friday. We will deliver goods ordered by you as soon as possible to the address you have given us for delivery. But in any event; 1-3 days of your order, or 5-10 days for back ordered products. We do not ship to the Highlands and Islands of Scotland, Isle of Man or Scilly and the Channel Islands. These include postcodes IM, IV, HS, KA27-28, KW, PA20-49, PA60-78, PH17-26, PH30-44, PH49-50, TR21-25, ZE. Only out of stock products that are due back in stock within the next 10 days are available for back order. You may purchase these products with your order, but the delivery of any back ordered product will be as and when our own delivery has arrived, usually within 5-10 days. You will not be charged any additional shipping cost for these items and the rest of your order will be delivered as usual. Basically we order our weekly stock from Germany before 12 noon on Thursdays. Back Orders placed on the site before that time will be delivered to you within 7 days, usually on a Tuesday. Place a Back Order after that time, delivery to you would be within 5-10 days and usually the following Tuesday.